Foster child Alisia Laboa (left) has been missing since running away from a New Bedford home in December. 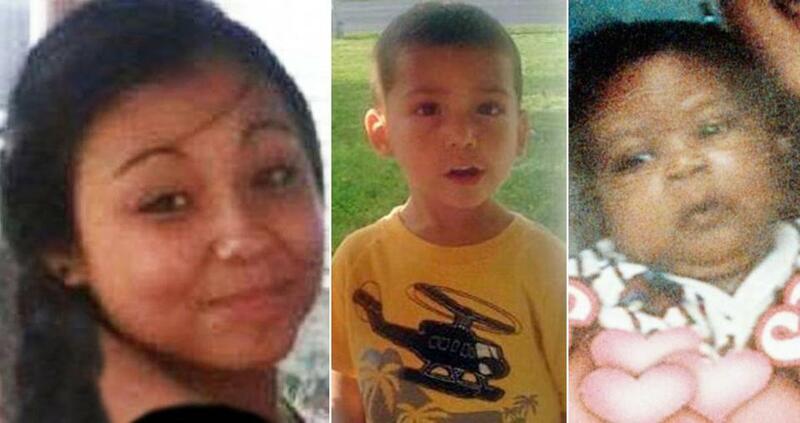 Jeremiah Oliver (center), 5, disappeared last year while on the state’s watch. Marlon Devine Santos (right) was 5 months old when he disappeared from his foster home in 1998 and has never been found. On any given day, hundreds of children in the Massachusetts welfare system may be missing, mostly teenagers listed as “on the run.” By Feb. 2, that list included 134 foster children as young as 13, according to a tally by the state Department of Children and Families viewed by the Globe. Social workers stopped checking on another 13 children recently because their parents were uncooperative, rebuffing caseworkers or moving without a forwarding address, DCF officials said. Yet Olga Roche, head of DCF, told lawmakers at a hearing last month that she was certain there were no other children in her agency’s care who were in danger or were missing, as was Jeremiah Oliver, a 5-year-old Fitchburg boy who disappeared last year while under the state’s watch. “Yes,” Roche said firmly. Asked whether she was “100 percent confident,” Roche said yes again. Loftus said the state is working hard to upgrade the agency’s technology to better supervise children in the system in future, including providing computer tablets to social workers to improve real-time reporting. “There are many things in our system we wish we had the ability to track more comprehensively,” Loftus said. He went on to say that he thought it “inaccurate to characterize children who have run away as ‘missing,’ ” even though the agency doesn’t know where they are and typically files missing persons reports on suspected runaways. “These are, oftentimes, teenagers who are facing difficult times in their lives and run away to stay with a friend for a period of time,” Loftus said. Some of Roche’s DCF colleagues, however, said it is common knowledge that the agency cannot be absolutely sure that every child is safe at all times, because they cannot be with the children every moment of the day and many children are missing for various reasons. Children’s advocates also said that, regardless of how they are classified by DCF, many missing children, including runaways, are potentially in danger. “My belief is that children who are on the run while in the care of DCF are ‘missing’ unless we know where they are,” said Charles Lerner, a former foster child who now runs a nonprofit that helps monitor abused or neglected children in the court system, the Boston chapter of Court Appointed Special Advocates. Maria Mossaides, who oversees two group homes for older children in Dorchester and Malden, said teenagers sometimes miss curfew, prompting the agency to file a police report. But most return within hours, she said. Her aunt, Rayna Martinez, said Alisia has stayed “everywhere and anywhere” since running away, including staying in New York with her birth mother, who is trying to regain custody of the girl. “Her mother is fighting for her,” said Martinez, who said she would have taken Alisia in herself, but thought she was barred from doing so because she has a criminal record. Family members paint a picture of a teenager who has been unhappy in the foster and group homes of the child welfare system since she was taken away from her mother roughly eight years ago over allegations that her mother’s boyfriend was abusive. Both Alisia and some of her relatives fault DCF for making the situation worse. “Alisia actively runs away on her own,” said New Bedford Detective Sergeant Matt Rayner, noting that Alisia has run away from the group home and other foster homes before. Betts also defended Roche’s suggestion that every other child under DCF’s watch is alive and healthy. “I think what the commissioner was talking about is that we have procedures in place that we count on to ensure that kids are safe and they are accounted for,” Betts said. However, Betts acknowledged that she did not know how many children under the state’s care are actually missing. Linsky, the Natick legislator who questioned Roche about missing children, said he was surprised to hear there were so many other missing children under DCF’s watch after Roche suggested there were none.